The school band comprising of about 40 students is trained by Mr. Bipin a talented musician. Students play the bugle, trumpet, base drum, side drum and cymbals. Regular classes are conducted. The school band leads the March Past for Annual Sports Day and welcomes VIP's for all important school functions. Mrs. Veronica & Ms. Sapna Basant are the teachers in charge. St. Ursula's band has been selected to play for all occasions at the Collector's office and has won several cups and certificates for their lively performance. St. Ursula's had the privilege of having late Mr. Handel Manuel, a renowned musician to train our students to sing melodiously and this rich tradition has been passed on. Students have been singing as part of their school curriculum and our Music Master, Mr. David Robert (Mr. Bobby) trains the school choir to sing for assemblies, special functions and competitions. Membership to Road Safety Patrol is open to the students of Std VI onwards. R.S.P cadets are trained by Mr. Vivek Danda - R.S.P Warden. Students assist in traffic control in the car parking area in the mornings . Students participate in competitions and awareness programmes on the importance of the use of helmets and against the usage of cell phones while driving. Mrs.Tesy, Mrs.Tamilarasi , Ms.Andrea & Ms. Cassia are the teachers in charge of the R.S.P cadets. 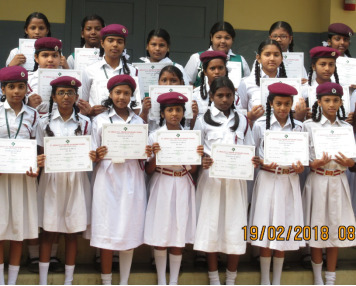 Students of Std VI onwards can be part of the guides programme. 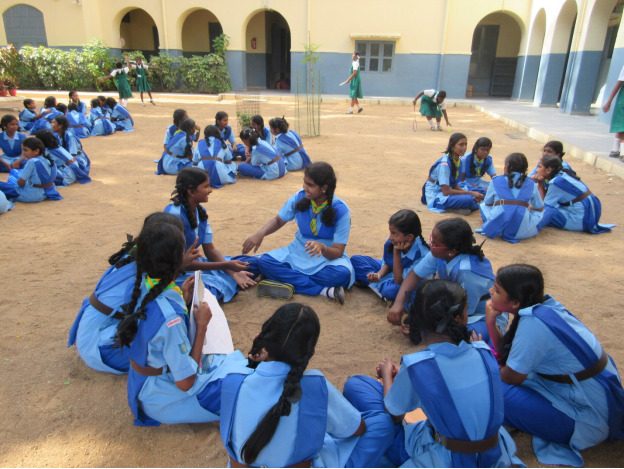 Guides participate in awareness rallies, camps and cultural competitions. Guides assist in traffic control in the car parking area in the mornings and help to maintain discipline in the school during important functions. Guides also appear for the Rashtrapathi Award Examinations. Mrs. Jennifer Joyce , Ms.Hannah , Ms.Nickey & Mrs.Selin are in charge of the Guides Programme. 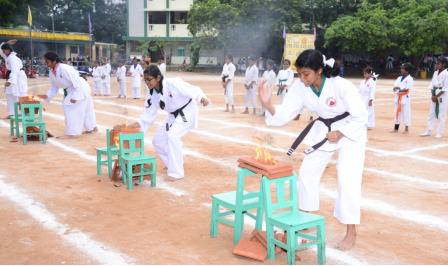 Karate classes are conducted twice a week and this is open to students from Std I-XII. At present about 60 students receive training from Sensei K. Karthi and Shihan E. Kebiraj - one of India's finest martial artists. Trained under Sensei Vasanth Kumar, he has won over 200 championships at the National and International levels. He has also trained special Police and Indian Commandos and holds 5th dan black belt in goju-ryu karate.Mrs.Sheeba NBaskar & Mrs.Hail Seelia Monica are incharge of the karate classes. In keeping with the need to keep alive the Indian culture and classical arts, Bharatha Natyam classes are conducted twice a week by Mrs. Girija Murugan a talented and accomplished Bharatha Natyam dancer. Mrs. Girija Murugan's school Saraswathi Bharatha Natya Vidyalaya has been in existence for the last 25 years. Our students are trained to perform for school functions, public programmes and have also participated in T.V programmes- "Margali Thirupavai"
The Eco- club functions on every Friday of the week to create awareness of ecological conservation of the local environment of the school children. The club works towards iinstilling a clean and green consciousness among students through innovative methods. With professional assistance from the Department of Horticulture, Madhavaram , the students themselves will grow plants using coco – peat. The following are planned for the year : growing of medicinal plants, a visit to the gobar gas plant, vertical gardening , vermiculture & to become bird feeders. Mrs. Nirmala J , Mrs.Mary Magdelene , Mrs. Amali & Mrs.Dayana Selvakumari are the teachers incharge of the club. The Maths Club aims at encouraging and enabling students to recognize that mathematics permeates the world around us and appreciate the usefulness, power and beauty of mathematics. Various activities are conducted to develop abstract, logical and critical thinking and the ability to reflect critically upon their work and the works of others .The students become confident in using mathematics to analyse and solve problems both in school and in real-life situations. The following teachers are incharge of the club at various levels: Mrs.shanthi Fernando , Ms.Jean D’Monte, Mrs.Jane Helen & Mrs. Diana Belsy. The literary club aims atmoulding students in the efficient use of the four skills. The students weave a tale and build it up to an end with a moral. They are trained in word building, grammar games.Their creative skills are hones by writing slogans for imaginary products. Enactment of short skirt, written by them in groups, training in public spreading, debates and panel discussion will for sure take them a long way. Teachers in-charge: Ms. Glaphyra Silvia Appavou , Sr. Suja Joseph , Mrs.Annama Johny & Mrs. Premila Fernando are the teachers in charge.